According to the Internets the first week in March is National Ghostwriters Week. Boo! It’s ok, you don’t have to be scared; ghostwriters are real, living writers working in a variety of industries, including yours. 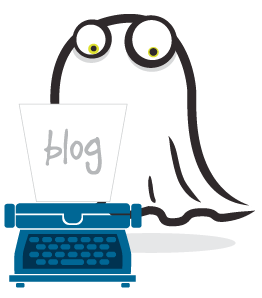 So what is a ghostwriter, and why are ghostwriters important? How can hiring a ghostwriter benefit your business? Put simply, a ghostwriter is a writer who takes no direct credit for his or her work. You know how all those celebrities “write” their tell-all books, releasing them into the wild to make even more profit off a ravaging and ravenous fanbase? Most hired a ghostwriter. Politicians also hire ghostwriters to write their books (and yes, even those eloquent speeches) as a tactic to leverage their popularity among the constituency. Seriously though, with little exception, ghostwriters write the overwhelming majority of those high-profile books—and they’re paid quite well. For example, the ghostwriter for Hillary Clinton’s memoirs might receive upwards of $500,000, but that’s obviously bound to be a highly lucrative project for all parties involved. Your average ghostwriting fees for book writing run much lower, perhaps $20,000 to $40,000 per book. So no, a celebrity ghostwriter isn’t paid to simply “keep quiet.” They’re paying for extremely high quality writing talent, while making an investment in their reputation. Not to mention, celebrity ghostwriting contracts come with a load of legalese, meaning the penalty for blabbing the real author’s name could result in a forfeiture of payment or worse. While ghostwriting plays an important role in our society, ghostwriters aren’t exactly supreme overlords. (Mwah ha ha.) After all, how would a ghostwriter know what to put in a celebrity tell-all if they weren’t in direct contact, listening to that person tell their story? Ghostwriters aren’t exactly controlling the flow of information. Rather, ghostwriters are translating someone else’s story into a readable and relatable format. Why? Because not everyone is an excellent writer. Sit down and try it sometime. Many people find that writing anything other than an email is a lot more difficult than imagined. How many people do you know who insist they’re going to write a book someday? Writing is hard—and time-consuming. Worse yet, your writing capability influences the way you are perceived by your friends, fans, colleagues, customers, and competitors. Great writing boosts your credibility. Bad writing means less respect from your peers. It’s unavoidable. A ghostwriter takes that apprehension out of the equation, so you’re not worried about making a sub par impression. Who Writes YOUR Web Content? Ghostwriters aren’t just book writers. Ghostwriters write articles, correspondence, stories, reviews, reports, and more. There is a ghostwriter out there for any project. It’s just a matter of finding the right writer for your particular task. Here at Posts By GhostTM, for example, we’re ghostbloggers. (Not a word yet? Well, it is now.) We help business owners build both company and professional credibility by writing regular, researched, well-written business blog entries and other web content. A large percentage of the material you’re reading online is written by someone other than the person whose name is on the article. Then does online ghostwritten web content lack authenticity? Absolutely not. Ghostwriters are chosen to represent a CEO, an entire company, sometimes even an entire industry. So the majority of that writing is directly derived from that industry leader, to truly showcase their expertise. For example, if we’re hired to represent a sailing club, we don’t just “go write about boats.” Instead, we work with those industry leaders to create accurate web content crafted to be clearly interpreted by a specific, well-defined target audience. So the bones and guts of ghostwritten content always come from the industry leaders. Ghostwriters just add the skin, ensuring that content is easier on the eyes and the mind. Hiring a ghostwriter for your online content is massively beneficial. A great ghostwriter speaks in the tone you wish to convey professionally, takes pride in his or her ability to thoroughly research your industry, writes search engine optimized (SEO) content using correct industry terminology, and always works as a secret representative of your business or organization. In short, your website is often the first impression you make with your potential customers, so poorly written web content has a direct and negative effect on the success of your business. Hire a professional ghostwriter to craft your web content and show the world how awesome you really are. Concerned about your online reputation? Looking to outshine the competition and increase your web visibility among your target audience? Have you hugged a ghost(writer) this week? Contact Posts By GhostTM or leave a comment below! Image courtesy of Flickr user serdal.